Happy to see Aiko healthy and recovered. On the other hand, I can't imagine my sixteen-year-old daughter wearing such a childish outfit. Last year she was ill for several weeks, she lost weight and was very weak. She couldn't attend school. Her aspect was really worrying in the photo of her fifteen birthday. C'est la Maison Impériale qui décide des tenues vestimentaires des membres de la famille imperiale.Incroyable !!! Always the same background, hopefully all the rooms are not so impersonal …but that is the same room where they just changing interior/furniture set for photography! 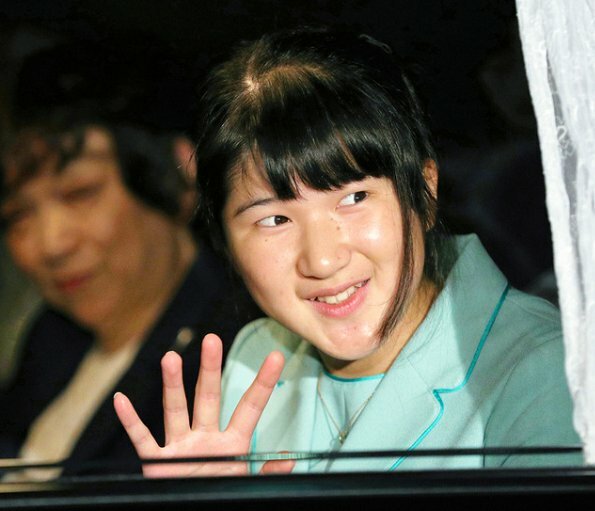 Fingers crossed for Aiko soon will be able to study abroad. I think that will be a good thing for her!! She looks to be very sweet but her outfit is really strange. There must be such a disconnect for her between, at least, what she has to wear and what she sees her school friends wearing. She must have a lot to deal with, on top of all the other issues and emotions someone her age faces. Estoy segura de que Aiko es una muchacha educada, culta y encantadora, pero si va a salir a estudiar al extranjero más vale que su madre le prepare un vestuario del siglo XXI porque si no, será objeto de burla de sus compañeros y eso es terrible. Estoy de acuerdo. A su edad lamentablemente esto puede ser un motivo para que sea víctima de bullying y no sería la primera vez. Este vestuario infantil está fuera de la realidad y sólo sirve para dejar a Aiko fuera de juego con sus compañeros. Seguro que se puede ser correcta y modesta sin necesidad de ser cursi, ñoña e infantil.